As digital ad companies build their “ad tech stacks” -- with some advertisers building in-house tech stacks of their own -- the number of toolsets used for a data-driven marketing campaign continues to rise. 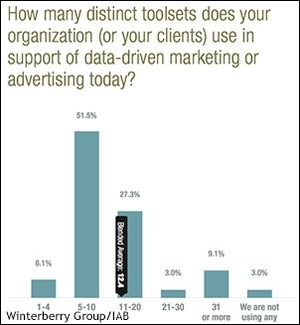 Over half of marketers are using 5-10 different toolsets, while one-fourth are using 11-20 different technologies. Nearly 10% of marketers use a towering 31 or more technologies for programmatic campaigns. On average, marketers use about a dozen different technologies in their “ad tech stack.” The data comes from research conducted by the Winterberry Group in conjunction with the IAB. The “best-of-breed” versus “suite” approach has been highlighted before. Technologies focused on one area are also referred to as “point solutions” and have fed the notion of “fragmentation” not just among consumers, but among marketing technologies as well. It’s Rube Goldberg machines stacked on topped of Rube Goldberg machines. 2 comments about "'Tech Stacks' Comprised Of An Ad Tech Dozen". Seth Ulinski from TBR, January 21, 2015 at 2:34 p.m.
Point solutions can be extremely valuable in a respective stack, integration is key. While some capabilities overlap may occur in an area such as analytics, 100% redundancy on campaign tactics (e.g. retargeting) is a waste of time and resources -- hopefully due to clients who are learning the ropes and not agencies leading the way. James Curran from www.staq.com, January 21, 2015 at 10:35 p.m. Yes, this is huge. TBR - Just integrating the entire tech stack into your first party ad server, we've made an entire business around it. Everyone uses multiple DSPs, because there is different inventory, relationships, bidding strategies, or data needs across all of them. On the Pub Side, SSPs and exchanges are treated like ad networks now and they are loaded with dozens of partners. There is no consolidation, because point solutions are able to focus in areas where full stack solutions cant. Long live the Frankenstack, it's not going anywhere.